WASHINGTON, DC, July 24, 2012 (ENS) – Virtually the entire ice sheet covering Greenland – from its coastal edges to its two-mile-thick center – experienced some degree of melting for several days this month, according to an analysis by NASA and university scientists based on measurements from three satellites. An estimated 97 percent of the top layer of the Greenland ice sheet thawed at some point in July, the satellite data shows. This is the largest extent of surface melting observed in three decades of satellite observations. One set of observations of the Greenland melt were made by an instrument called the Special Sensor Microwave Imager/Sounder aboard the satellite operated by the U.S. Air Force’s Defense Meteorological Satellite Progam, DMSP. Another set of satellite data of the Greenland melt was obtained from India’s OceanSat-2. 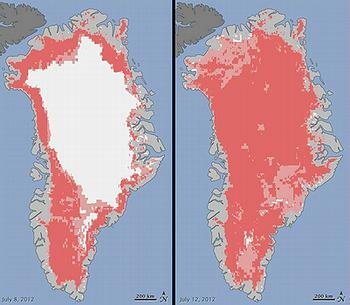 Further data showing the Greenland melt come from the Moderate Resolution Imaging Spectroradiometer, or MODIS, on NASA’s Terra and Aqua satellites. The satellites measure different physical properties at different scales, and they pass over Greenland at different times. Taken together, they provide a picture of an extreme melt event. On July 8, satellites showed that about 40 percent of the ice sheet had undergone thawing at or near the surface. By July 12, the extent of melting spread way beyond the norm. Located between the Arctic and Atlantic oceans, Greenland is an autonomous country within the Kingdom of Denmark. British climate scientist Jonathan Gregory has estimated that if the Greenland ice sheet were to melt away completely, the world’s sea level would rise by more than seven meters (23 feet). 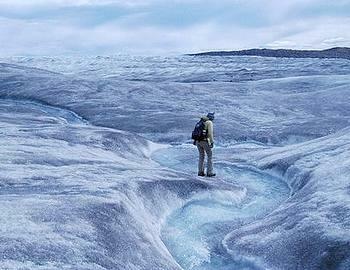 Every summer, a fraction of the surface of the Greenland ice sheet naturally melts. At high elevations, most of the melt water quickly refreezes in place. Near the coast, some of the melted water is retained by the ice sheet and the rest flows into the ocean. In mid-July, Son Nghiem of NASA’s Jet Propulsion Laboratory was analyzing radar data from the Indian Space Research Organisation’s Oceansat-2 satellite when he noticed that most of Greenland appeared to have undergone surface melting on July 12. Nghiem consulted with Dorothy Hall, who studies the surface temperature of Greenland from NASA’s Goddard Space Flight Center. She confirmed that MODIS showed unusually high temperatures over the ice sheet surface and that melt was extensive. Colleagues Thomas Mote of the University of Georgia and Marco Tedesco of the City University of New York confirmed the melt with passive-microwave data from the DMSP. The extreme melting coincided with an unusually strong ridge of warm air – a “heat dome” – over Greenland. The ridge was one in a series that has dominated Greenland’s weather between May and July 2012. Even the area around Summit Station in central Greenland, which at two miles above sea level is near the highest point of the ice sheet, showed signs of melting. A weather station at Summit Station operated by the National Oceanic and Atmospheric Administration confirmed that air temperatures hovered above or within a degree of freezing for several hours from July 11 to July 12. Such pronounced melting at Summit and across the ice sheet has not occurred since 1889, according to ice cores analyzed by Kaitlin Keegan at Dartmouth College. The Petermann Glacier grinds and slides toward the sea along the northwestern coast of Greenland, terminating in a giant floating ice tongue. A massive iceberg broke off of the Petermann Glacier in 2010; now, nearly two years later, the Aqua satellite recorded the calving of another huge chunk of ice. Ted Scambos, lead scientist at the U.S. National Snow and Ice Data Center, said the loss of this latest ice chunk shows more of the glacier is breaking off than at any time in modern history. This calving event marks a retreat of the Petermann Glacier “farther back than historical calving fronts,” he said. Konrad Steffen, director of the Swiss Federal Institute for Forest, Snow, and Landscape Research WSL, estimates this iceberg is roughly half the size of the ice island that broke off the Petermann Glacier in 2010.